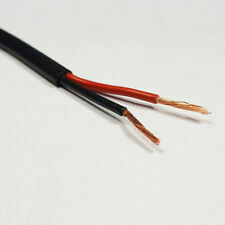 1 x 5M 1.5mm ² Thin Wall Twin Core Automotive Cable. All Twin Core Cable Sizes Available Here. This cable is in many ways the more modern and technically advanced version of the Standard P.V.C BS6862 cables. 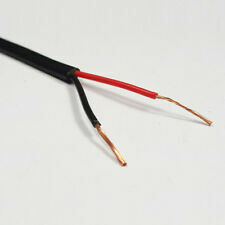 1 x 5M 0.5mm ² Thin Wall Twin Core Automotive Cable. All Twin Core Cable Sizes Available Here. This cable is in many ways the more modern and technically advanced version of the Standard P.V.C BS6862 cables. 450mm Length. 16mm² Conductor (Cross sectional area) Flexible copper cable. Black PVC insulation. 110A Rated. 2 X 16 Strand. 2x0.5mm 0.5mm². 10m of 1.0mm² Automotive Cable. i.e 7m red/white 3m black/yellow = 10m. GREY BROWN PURPLE PINK LIGHT GREEN ORANGE. 32/0.20 Thinwall Single Core Cable. RED BLACK GREEN WHITE YELLOW BLUE. Conductor: 25mm2. - Single core PVC battery & welding cables. Highly Flexible whilst remaining seriously durable. - Copper conductor with P.V.C insulation, (resistant to oils, petrol, diesel, lubes and a range of diluted acids). 2x 9 Strand. Total cable thickness including insulation: 5.8mm. Red and Black inner insulation colours. Black flat outer insulation. 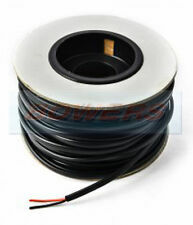 PVC FLAT TWIN CORE CABLE Reel Size = 30 meters Black colour outer sheath PVC covering internal core colours red and black 2x 9/0.30mm cable rated @ 5.75amp Conductor Specification (mm): 2 x 9/0.30Conductor Cross Section (mm²): 2 x 0.65Maximum Overall Diameter (mm): 6.1 x 3.8Maximum Loading (Watts) @ 12volt = 69w / 24volt = 138w General purpose low voltage 12/24 volt wiring cables suitable for use in the automotive marine industries as well as for home wiring or DIY projects. Manufactured in accordance with BS6862 Part 1 1971, where applicable. Suitable for 12v and 24v systems (Maximum 100v). Resistant to petrol, diesel, lubricating oils and diluted acids. Suitable for use at temperatures from -30°C to 70°C. Plain copper conductors - PVC insulated and . TW 2 Core Flat Twin Cable, 1.0mm2, 10m. Length 10m. thin wall flat twin 1mm² 32 / 0.20mm. Core Type TW 2 Core Flat Twin Cable. High temperature thin wall. Thin Wall 02/01.10m. 70 degrees. 11 amp = 132 watts 12 amp = 144 watts. Nominal Conductor Specification : 322/0.30mm. Conductor Cross Section : 205mm². 25mm² 170amp. Length of Cable : 3m. Sheath Colour : Black. Oxygen free, Multi Strand, Flexible. 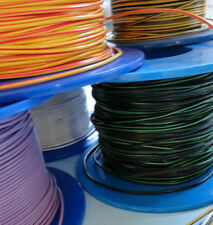 Plain copper conductors - PVC insulated -30'C to 70'C. 16mm2 PVC Battery / Welding Cables. - Single core battery & welding cables. Highly flexible whilst remaining seriously durable. - Easy to strip for speedy stress free usage. PVC16 208/0.30 16 110 8.85 Black, Red. 50mm² Cable. Single insulated battery / starter cable. 25mm² 170amp. Length of Cable : 3m. Oxygen free, Multi Strand, Flexible. Battery/Welding Cable. Cable available inVarious Lengths. Sheath Colour : Red. Conductor Cross Section : 205mm². 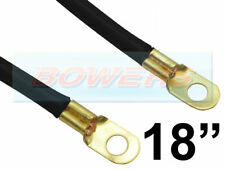 1 x 10M 2.0mm ² Thin Wall Twin Core Automotive Cable. All Twin Core Cable Sizes Available Here. This cable is in many ways the more modern and technically advanced version of the Standard P.V.C BS6862 cables. 5m 0.7mm2 7 Core Cable. TW 7 Core Cable, 0.75mm2, 5m. thin wall 24 / 0.20mm. Thin Wall 07/01.30. High temperature thin wall. 11 amp = 132 watts 12 amp = 144 watts. Core Type TW 7 Core Cable. 12V / 24V AUTOMOTIVE 5m RATED TO 11 AMP 8 CORE 7 1 THIN WALL TRAILER CABLE WIRE. 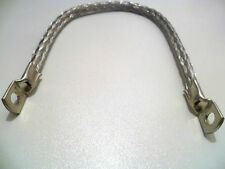 8 Core Cable, 0.50mm²/1.0mm², 5m. High temperature thin wall. Core Type 8 Core Cable. Below we have compiled a guide to help you decide which cable you need for your particular application. Length: 225mm. Black Battery Switch Starter Strap. Suitable for use with cars, motorcycles, HGV's, marine & plant etc. Flexible negative and earth battery cable. Length: 450mm. Red Motorbike Battery Switch Starter Strap. Suitable for use with cars, motorcycles, HGV's, marine & plant etc. Flexible negative and earth battery cable. Length of Cable : 10m. 16mm² 110amp. Conductor Cross Section : 16mm ². Oxygen free, Multi Strand, Flexible. Battery/Welding Cable. Cable available inVarious Lengths. Sheath Colour : Red. Insulated Ring Lug Black. 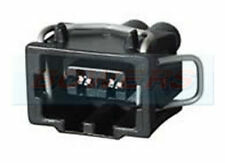 Insulated Ring Lug Black Battery Lead. Battery Strap. Battery Switch. Earth Lead. Heavy Duty 110AMP 16mm2 206/030. 18" (450mm). 600mm Length. 16mm² Conductor (Cross sectional area) Flexible copper cable. Black PVC insulation. 110A Rated. 25mm2 PVC Battery / Welding Cables. - Single core battery & welding cables. Highly flexible whilst remaining seriously durable. PVC25 322/0.30 25 170 9.75 Black, Red. ALL CABLE IS CUT / WOUND TO YOUR CUSTOM LENGTH AS REQUESTED. 1.5mm 21A 262W 30/0.25 16 AWG. HIGH PERFORMANCE Single Core - Multi Strand wiring cable for use in most electrical applications including Do not confuse this cable with automotive thin wall cable, this also cable has high impact resistant standard size insulation. Tape Length: 45m. Non Adhesive Self-Clinging PVC Loom Tape. Commonly used for the manufacture of wiring looms / harnesses and for classic car & motorcycle loom / harness repairs & restorations. Length: 225mm. Red Battery Switch Starter Strap. Suitable for use with cars, motorcycles, HGV's, marine & plant etc. Flexible positive and earth battery cable. Length: 450mm. Black Motorbike Battery Switch Starter Strap. Suitable for use with cars, motorcycles, HGV's, marine & plant etc. Flexible negative and earth battery cable. Current Rate - 40A. Type - Fig 8. 2 core stranded power cable for the connection of automotive products and other applications. Stranded copper/copper clad aluminium conductors in red and black PVC outer sheath. Features: 100% brand new and high quality 1-Pin, 2-Pin, 3-Pin, 4-Pin, 5-Pin and 6-Pin Super sealed Waterproof Electrical Wire Connector Sets with Standard and Mini Blade Fuses Dustproof, waterproof, high sensing performance requirement electrical system High pressure, reliable safe connection, no loose, light in weight Colorful fuses is easy to recognize, protect your car and electrical device from short circuit,overload etc. Type - Fig 8. Current Rate - 10A. 2 core stranded power cable for the connection of automotive products and other applications. 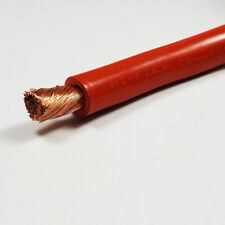 Stranded copper/copper clad aluminium conductors in red and black PVC outer sheath. A 100m roll of twin core red/black cable suitable either for electrical wiring or for speaker wiring. Length: 100m. Speaker / Power Cable. PVC TWIN CORE CABLE (FLAT TWIN) Sold by 5 meters Reel Size = 30m General purpose low voltage wiring cables suitable for use in the automotive marine industries as well as for home wiring or DIY projects. Manufactured in accordance with BS6862 Part 1 1971, where applicable. Suitable for 12v and 24v systems. Resistant to petrol, diesel, lubricating oils and diluted acids. Suitable for use at temperatures from -30°C to 70°C. Plain copper conductors - PVC insulated and sheathed 70°C. 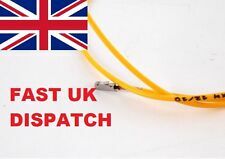 Sheath Colour: Black Core Colours: Black Red Conductor Specification (mm): 2 x 35/0.30 Nominal Current Rating (AMP): 21.75 Conductor Cross Section (mm²): 2 x 2.5 FAST DISPATCH PLEASE NOTE Important notice BEFORE ordering Please DO NOT rely on the compatibility list to make your decision. 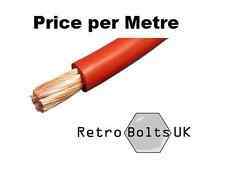 110 AMP BATTERY CABLE Sold by the meter Reel Size = 10m Single insulated extra flexible battery/welding cables designed for use in tough working environments. Manufactured in accordance with BS6862 Part 1 1971, where applicable. Resistant to petrol, diesel, lubricating oils and diluted acids. Plain copper conductors - PVC insulated -30°C to 70°C. Sheath Colour: Red Conductor Specification (mm): 203/0.30 Nominal Current Rating (AMP): 110 Conductor Cross Section (mm²): 16 Overall Cable Diameter (mm): 8.3 FAST DISPATCH PLEASE NOTE Important notice BEFORE ordering Please DO NOT rely on the compatibility list to make your decision of parts, as cars come with many variations and fitments on the same make and models. Check things like dimensions size and other . Length 50m. It can be used for vehicle lighting, audio, motors, relays and most other applications. 11 amp = 132 watts 12 amp = 144 watts. Core Type TW 1 Core Cable. TW 1 Core Cable, 11Amp. Length: 600mm. Black Motorbike Battery Switch Starter Strap. Suitable for use with cars, motorcycles, HGV's, marine & plant etc. Flexible negative and earth battery cable. Conductor: 16mm2. - Single core PVC battery & welding cables. Highly Flexible whilst remaining seriously durable. - Copper conductor with P.V.C insulation, (resistant to oils, petrol, diesel, lubes and a range of diluted acids). 2.5mm 30A 360W 50/0.25 14 AWG. HIGH PERFORMANCE Single Core - Multi Strand wiring cable for use in most electrical applications including Do not confuse this cable with automotive thin wall cable, this also cable has high impact resistant standard size insulation. Length 600mm between hole centres. 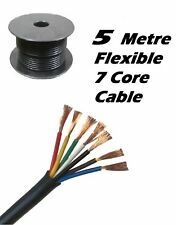 16mm² flexible copper conductor - PVC insulated. BATTERY POWER STRAP 36 Inch cable with 2 rings Hi Flex Heavy duty 25mm² Ring size is 8mm Maximum Current: 170Amps Ideal for broken cut damaged leads or for upgrades Also a good car audio system power cable upgrade. 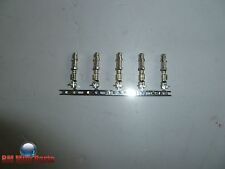 Allows more flow of current to you car amplifiers. Double up on your earth straps and power cables will have a big impact if you are running a big sound system / power caps etc. Also can be used for a split charging unit upgrade and 2nd battery. Can be used on Boats, Motorcycles Make sure you order the correct size We also have other sizes in our shop Buy your battery terminal ring covers from the links below: Battery Terminal Covers Battery Ring Covers Fast Dispatch PLEASE NOTE Important notice BEFORE ordering Please DO NOT rely . 225mm Length. 16mm² Conductor (Cross sectional area) Flexible copper cable. Black PVC insulation. 110A Rated. 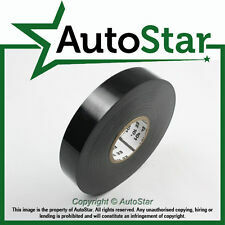 Non adhesive PVC tape used for wrapping type applications such as protecting or repairing harnesses and wiring looms against abrasion. Colour -Black. Roll Length (m) - 40.0.